How the mighty have fallen! In November 1999, when the first Pokémon theatrical feature, Pokémon the First Movie: Mewtwo Strikes Back, was released theatrically in the U.S., it was distributed by Warner Bros., played on 3,043 screens, and was the #1 grosser earning $85,744,662. Its final box office was over $163 million. This year the 15th annual Pokémon movie, Pokémon the Movie: Kyurem vs. the Sword of Justice, which opened as the #3 grosser in Japan on July 14, will be shown only on the Cartoon Network on December 8. Ho-hum. Well, here is the English-language trailer. I only ever cared for the original 151 Pokemon and have never masturbated to any of them (not even Ebiwara/Hitmonchan), but credit to Nintendo for keeping a toy craze going strong since 1997. Well movie number 15 is seldom a success, unless it's James Bond or something. The problem with Pokemon is the craze died out because they never did anything new. If they diversified the games or aged it up they could both keep old fans and add new ones but they really just let it stagnate and fall off the grid. I'll probably watch anyway as the movies at least get a decent budget and quality animation as well as, usually, a better story than the episodes. After movie 5, Pokémon is now a guilty pleasure for me. Well, key word here is continuity. And logic. And common sense. 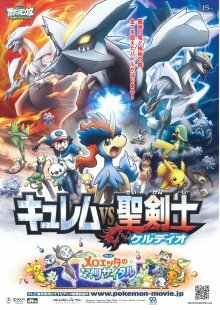 I just saw The Pokémon Movie: Kyurem vs. the Sword of Justice, this year's Pokémon theatrical feature, on the Cartoon Network yesterday! (My sister recorded it for me on her TiVo for my birthday.) A 70-minute movie in a two-hour time slot, which means that it had 50 minutes of commercials; and it felt like it, too. What impressed me the most was how much better the animation quality, or at least the background paintings, are in 2012 vs. the first Pokémon movie in 1999. The story was the usual "Ash & Pikachu and their friends must fight The Most Dangerous Pokémon Of All, And Learn A Valuable Moral Lesson In the Process". Eeeehh. The coltlike Keldeo is cute.